Ribbon blenders have been the workhorses for blending applications and are very common in the chemical, pharmaceutical, and food industries. This article explains the construction, operation and applications of a ribbon blender. It elaborates on the design options that make the equipment versatile. Blending large volumes of dry solids. Dry powder to wet phase mixing. Mixing of bulk drugs, chemicals, and cosmetic powders. Dry Blending of capsule formulations. 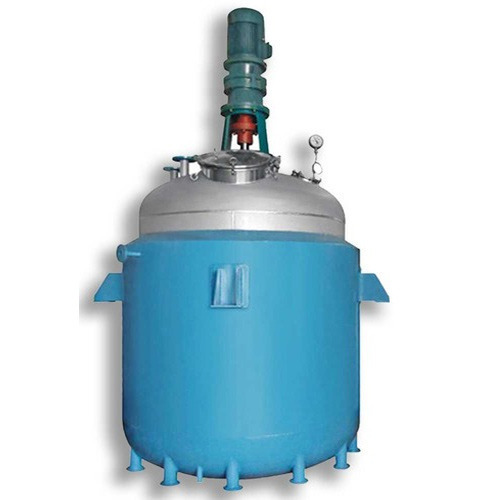 Lubrication of dry granules in large quantity. Heating, cooling, and drying of materials. 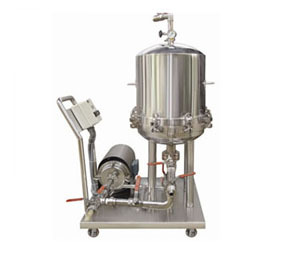 Coating solid particles with small amounts of liquids to produce formulations. 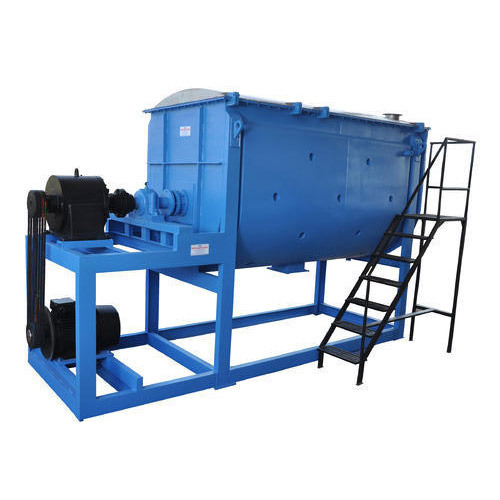 Ribbon Blenders consist of a U-shaped horizontal trough and a specially fabricated ribbon agitator. A ribbon agitator consists of a set of inner and outer helical agitators. The outer ribbon moves materials in one direction and the inner ribbon moves the materials in the opposite direction. The ribbons rotate at approx. 300 fpm moves materials both radially and laterally to insure thorough blends in short cycle times. Ribbon agitators are used for blends that will be between 40 and 100% of the rated capacity of the blender. An alternate agitator is our paddle design. The paddles are positioned to move materials in opposing lateral directions and radially. 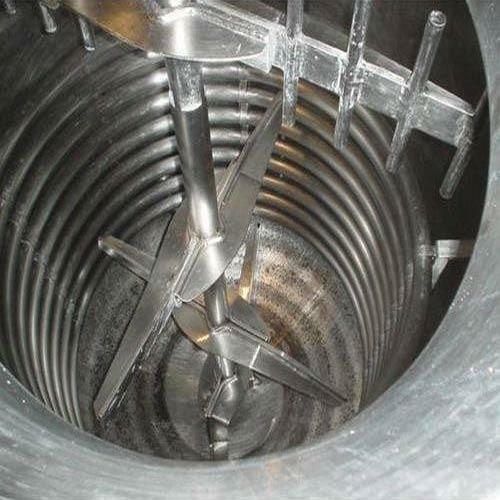 The paddle design is normally applied where friable materials are being blended and when batches as small as 15% of the total capacity are going to be mixed in one blender. 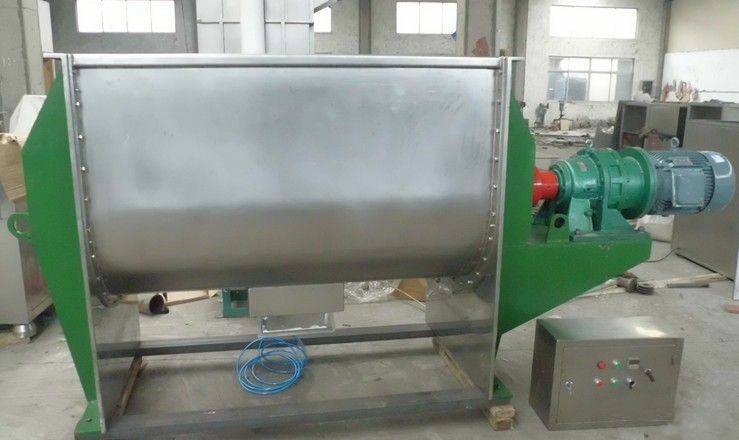 Ribbon Blender (also named ribbon mixer) is a basic industrial mixing machine. They consist, basically, of a trough-shaped shell (usually 2 to 3 times longer than it is wide) with a semicircular bottom, fitted with a horizontal longitudinal shaft on which are mounted arms supporting a combination of ribbon blades, paddles or helical screws set at a fairly close clearance to the semicircular mixer body so that no layer of material remains on the bottom of the ribbon mixer. The most effective design of ribbon layout is the double spiral in which the outer ribbon moves the product in one direction and the inner ribbon moves it in the opposite direction. The ribbons rotate and move materials both radially and laterally to insure thorough blends in short cycle times. Ribbon agitators are used for blends that will be between 40 and 70% of the rated capacity of ribbon blender.